On Airline Hwy near the Bluebonnet/Airline intersection. Same side as Mike's Audio and right by it. If you are into fish then this is the place for you. Mark knows more than any other around. Good, quality LOCAL service!! Excellent place. I've known Mark since before he had his own store and am glad to see his success at The Aquarium Store. Without a doubt, every time I'm in there, whether Mark is there or not, the store is clean, employees are engaging and the products (fish, tanks, stands, live rock, etc.) all look great. They are my go-to people for all things aquarium! I've been to this LFS twice and the second time will be my last. I walked into the store and a couple seconds later a lady (customer) walks out after having asked some questions of an employee. As soon as she was out the door, the employee says, to his coworker, in reference to the recently departed customer, &quot;Wow what a f**king idiot.&quot; I kid you not. Well I mistakenly decided to continue looking around the store, even after hearing that little exchange. So I asked the dude sitting at the front desk, just sitting on the computer, for help and he gives me an exasperated sigh and a look like, &quot;I can't believe you are making me do work.&quot; Seriously man? You work at a fish store. It's not that difficult. Nothing in their store is labeled correctly. What is labeled is either mislabeled or illegible. They had an orange crawfish for sale and I was wondering what the price was. The guy tells me 30 bucks cuz it's an &quot;Australian&quot; crawfish. Now I don't have a degree in aquatic invertebrate biology, but I've kept crawfish in aquaria for a while now and anybody with any experience with crawfish could tell it was a North American species. So either these people are too dense to research what it is they're selling or they're simply content to blatantly lie to their customers (not surprising, considering the customers are &quot;f**king idiots&quot; anyhow). The same crawfish would cost me 5 bucks online or about 10 shipped. Both of my experiences there, the employees were both rude and ignorant. Rude in the sense that their language is pretty awful. Avoid bringing your children here. They are ignorant in the sense that almost every question that you ask is met with &quot;I'm not sure. I'd have to ask Mark. He's not here right now.&quot; I'm sure Mark is a well-educated and upstanding fellow, but he should either be there to answer questions or hire people who are capable of answering those questions themselves. As much as it pains me to say it, because I'm all about supporting LFS, you'd be better off going to Petsmart or Petco. Don't punish yourself by visiting the Aquarium Store. I've been to this store a ton of times and EVERY time I go they're rude & act like they don't have time to help me. They do have a nice selection, that is, if you like fish that have been in tanks with other dead fish, & who wants to shop where the service is TERRIBLE! 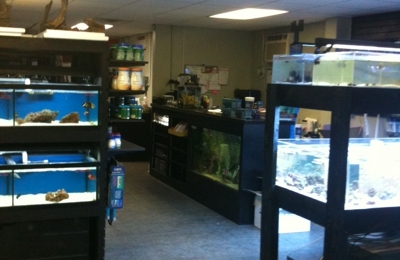 This is the BEST and most knowledgeable specialty fish store in LA! Before I married the owner Mark I was a customer. He taught me the right way to successfully maintain a reef tank when I was about ready to quit from all the wrong info I had gotten else where. He opened the very first saltwater only fish store(Marks Marine Aquarium) back in 1987 when he was 19 years old. Ive NEVER met anyone who knows more about the hobby than him. It's soooo PATHETIC that his competition has to make FAKE emails to write FAKE reviews about his store! Quit being haters because he works hard and deserves the success he has earned! Everything he does you copy anyway so you should be thanking him not bad mouthing him! Good selection, healthy fish. I went in looking for a specific kind of fish that you'll never see at walmart, and they had plenty to choose from. The staff was knowledgeable, helpful and courteous. I haven't seen a selection of fish this large or healthy since Mr. Fish closed down in Covington. Nice to see them in town, I hope they do well! Thanks so much for all your help! Love your store! This is a great store. Excellent customer service and they actually know what they are talking about. Good quality fish, not like the diseased ones that pet smart and walmart sell. 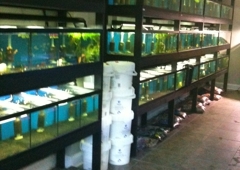 This store has the biggest selection of tropical fish I have ever seen! Staff is very knowledgeable and helpful. I went in looking for a particular fish that's not very common and they didn't have it, but they ordered it for me and it came in the same week. I'm so glad there is finally a tropical fish store in town that knows what they are doing and has good prices on healthy fish. Oh.....and they sell ponds, koi, and reptiles. I'll be doing my pond business too with them from now on. Expecting a Baby: Should We Adopt a Pet Before Baby -- or After? But if your heart’s set on getting a pet before baby arrives, take the following into serious consideration before making the leap. What Pet-Related Chores Can My Kids Do and Should I Pay Them For It? Pet-related chores are a very common way for parents to introduce their children to household responsibilities -- and money management..